Brighten up your winter days while wearing this rich red-colored poncho! 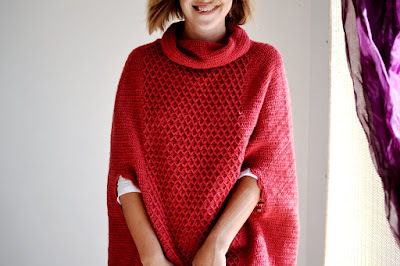 Cherry Jar Poncho pattern, originally published in West Yorkshire Spinners - Crochet Winter Warmers pamphlet distributed with Crochet Now Issue 10, is now available in Lena's store on Ravelry as an individual pattern download. The poncho is worked from the top down in the round. The textured diamond pattern adds an interest to the front. The arm openings are embellished with the scalloped edging.